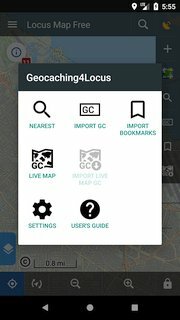 You can search nearest geocaches around the coordinates and import them into Locus Map for off-line usage. And later use them directly on the place. 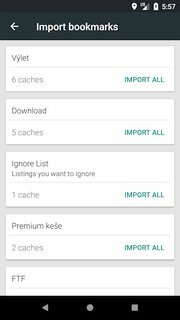 Searching and importing geocache by its code is also supported. This also include importing geocache from geocaching.com webpage address. 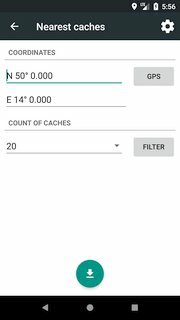 Do you want to look around for some geocaches on the map without import them into Locus Map? You can! 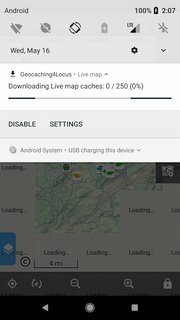 Already stored geocaches in Locus map can be easily updated with one touch. Only a few logs are downloaded with the Import action. But you can download up to 100 logs with this feature. Enough to figure out, what happened with geocache a few days ago. Do you have bookmarked geocaches on Geocaching website? This feature allows you to browse your bookmark lists and import all or selected geocaches into Locus Map.